Morgan Thompson looks like he’s levitating. 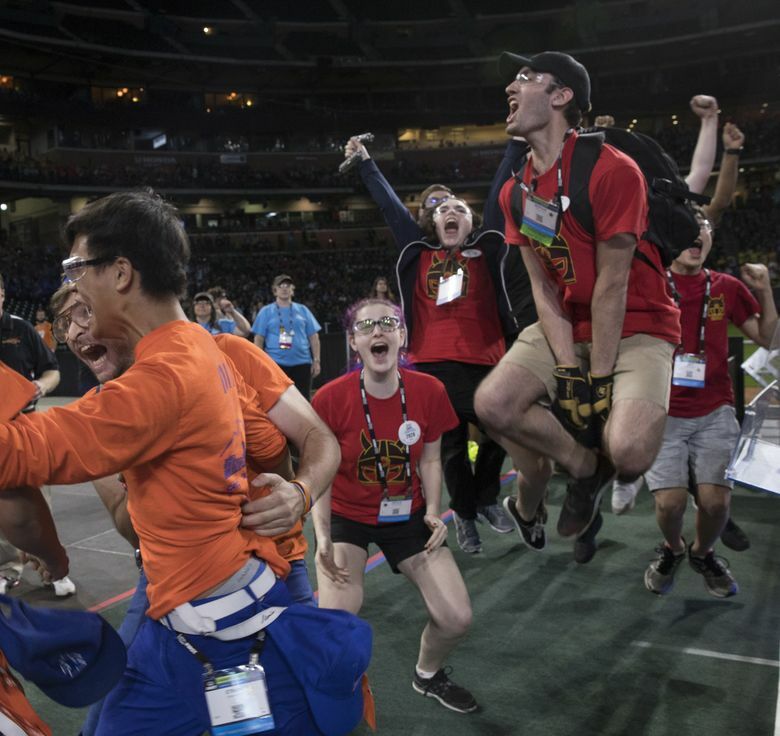 The Ballard High School senior, 18, was captured leaping for joy after helping the school’s Viking Robotics club lay claim to a first-place win in front of thousands of spectators at a recent competition in Houston, Texas, that included teams from 25 countries. Thompson’s team, named FRC 2928, was part of a four-team alliance that advanced to the final round of the 26th annual FIRST Robotics Competition. The event was the culmination of a six-week project, in which teams designed and built a robot capable of operating on its own and with a driver, climbing a rope, shooting and retrieving whiffle balls and gears, and traveling at speeds up to 13 mph. To win the timed competition, it faced off against another four-team alliance in a game that required collaboration and coordination to fuel a makeshift spacecraft with whiffle balls and gears it needed for takeoff. Thompson, who drove the Vikings’ robot in the competition when it wasn’t operating on its own, said he wasn’t even aware of the score until the clock ran out. “I was shaking with adrenaline when it was over,’’ he said. Retired engineer Fred Powell, a volunteer adviser for the Ballard club, said the team was solidly in the middle of the pack of competitors when one of the teams in the top eight picked the Ballard team to join its alliance. The Ballard robot was built after school, and funded through outside grants, parent support and student fundraising, Powell said. The club sent 27 students to the final competition after winning the district-level competition two weeks earlier. The championship video can be viewed on YouTube. A team of seven middle- school girls from Bellevue captured first place in its division, and second place as part of another alliance that competed in the same competition. The team, Robo Thunder #9915, was undefeated in nine rounds of qualifying matches when it went into the playoffs, according Tanya Mead, the team’s head coach. Based in Eastgate, the team is only 2 years old, Mead said, and the girls revised and improved their robot after each competition.